Faced with competition from increasingly more capable camera phones, Zoom has announced the Q3HD Handy Video Recorder, combining their well regarded audio recording abilities with HD movie capture. Packing 1080p recording (at 30 frames per second) and 720p at 60 frames per second in MPEG-4 AVC/H.264 (MOV) formats, this little fella will comfortably out-perform any smartphone in town, with its two ‘studio-quality’ condenser mics producing high quality audio files. There’s also a less useful 4x digital zoom, with a 2.4-inch color LCD for monitoring recordings, plus NTSC/PAL TV, HDMI and USB 2.0 ports. Videos can be recorded in 720p or 1080p formats, in both landscape or portrait format, and there’s three different lighting settings onboard: “Auto,” “Concert Lighting” and “Night”. 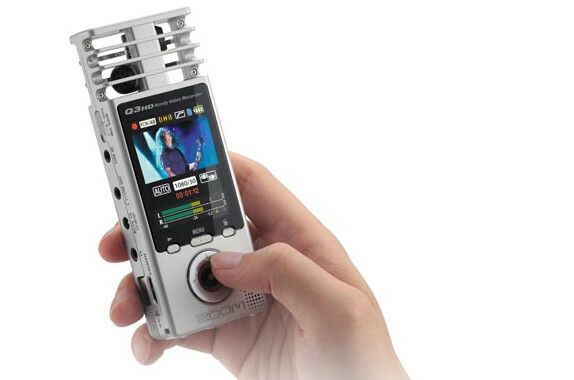 The Q3HD uses the same microphone capsules as Zoom’s legendary H4n Handy Recorder, with the two condenser mics configured in a wide 120° X/Y pattern. The LCD monitor offers audio meters for monitoring and setting your levels, with the option to set the gain to High or Low to record in soft or loud environments, and files can be saved at 44.1/48/96kHz 16/24-bit WAV (PCM) or AAC up to 320kbps. 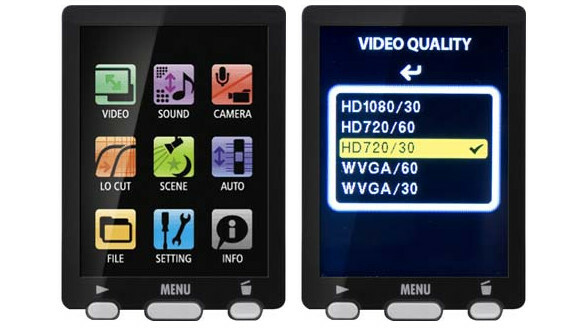 The LCD screen also displays icons for battery life, sound quality, current operation status, screen setting, image size/frame rate, elapsed/remaining time, recording source, recording destination and lo-cut filter information. 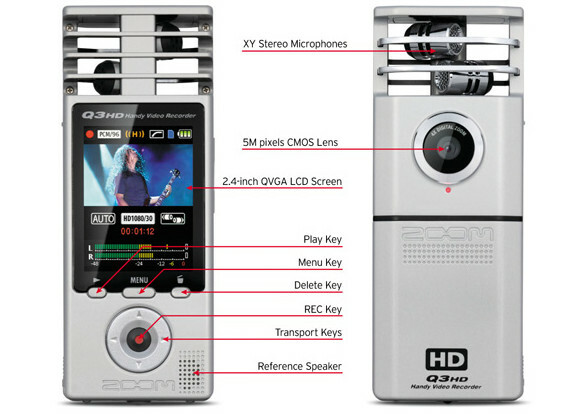 Basic movie editing can be done on the Q3HD, with a handy built-in USB cable letting users download movies to their computer with the bundled HandyShare software offering effects like reverb and ‘audio normalise’ audio for outputting consistent levels,. 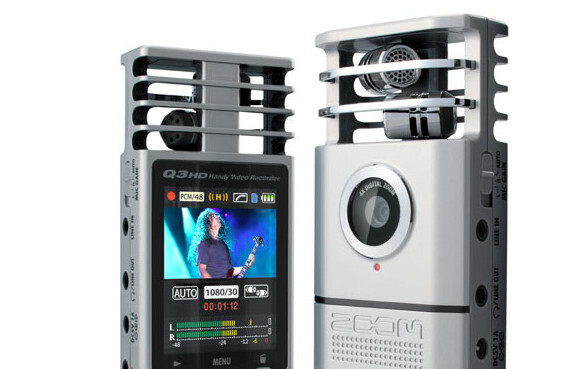 Zoom is aiming the Q3HD recorder at musicians, travellers, students, journalists and bloggers, and the package comes with a 2GB SD for recording up to 45 minutes of 30fps HD video. Stick in a 32GB card and you’ll get 7 hours of HD moviemaking. The Q3HD is powered by two AA batteries, although we havent heard how much recording time you’ll get per charge, neither have Zoom announced the pricing yet. Very interesting-looking machine. Having above-average sound quality makes some sense for a budget video camera, since most people get more irritated by indifferent audio over indifferent images. If it’s got a screw-thread underneath, this plus a monopod would make a handy street filming bit of kit.